It is one of the most commonly used spiral bevel gears, used largely in automotive industry. In order to enable the axle ratio setting a vehicle must be must be equipped with a racing gearbox, also known as ring and pinion gears. 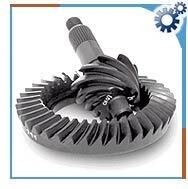 A ring and pinion gear set is expensive to buy and install, requiring highly skilled technicians. This gear is hypoid, it not only rotates against each other but also wipe across the drive surfaces, creating the shearing force that cuts the lubricants changing its viscosity. Gear oil used here is heavy and the thickness of the oil changes with the temperature. There are bearings in the final drive, among which two support the drive pinion and two support the case that holds the ring gear and one on each axle nearest the wheel. To compute a new gear ratio, one needs to enter the stock ring pinion gears ratio along with the old and new tier size. It is also used in calculating the tier width and the speed of wheels. It is used in heavy truck differentials. It is also used in tire rotation, wheel alignment and tire balance. It is one of the greatest masterpieces in automotive mechanism. It works for higher driving and loading capacity in the drive line from transmission to wheels. It is also used to compensate for discrepancies in the respective rotation rate of the drive wheels between inside and outside wheels during cornering for limited effective torque to the wheels with lower coefficient of friction.